LIVING FAITH FAMILY WORSHIP CHURCH is a Word of Faith Church. Not denominational but pre-denomination as we find victory in the Cross of Christ. A Church that preaches / teaches the full Gospel of Jesus... His Life, His Death, His Resurrection and His soon Return. A Church completely led by the Holy Spirit in which we have been freely given. A Church that honors Jesus in Praise / Worship and the dance. A Church of Faith and the Word with no compromise with a focus on the family. Matthew 19:26 "With God all things are possible"
Our assignment on Earth is a “Present Work”! 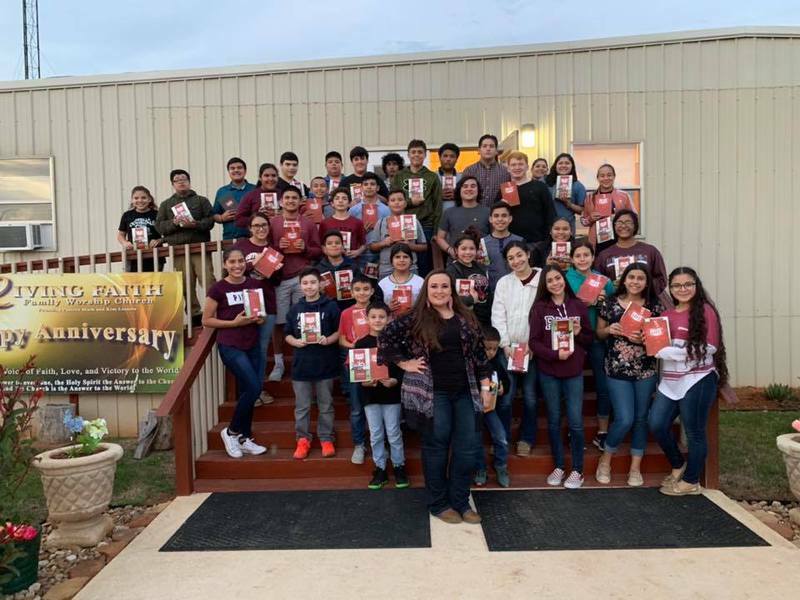 Click on the image to sow a seed for these youth bibles. 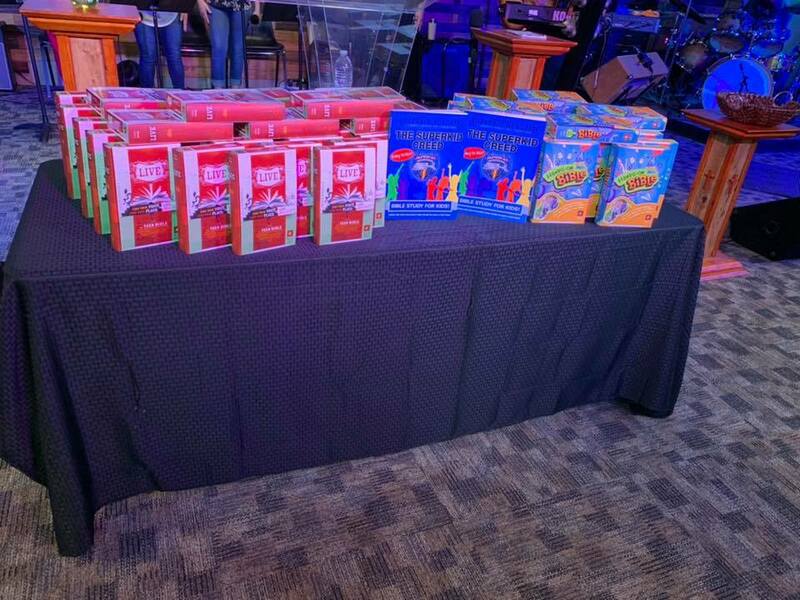 Thank you everyone who sowed for Bibles...we gave out the first batch today..God is so good...if you have it in your heart to give for more Bible please give by clicking on the donate button located on the left side of the reading panel. For questions or more information about our current events please feel free to use the "Contact Us" section of this website. You may also contact our Pastors directly by calling or texting the phone numbers listed on the left hand side panel of this page. Live Video Streaming is now in progress... The Next Service beings at 10:00am CST on 04/07/2019. You may also view our live facebook feed by clicking here. To view the video in full screen, click on the full screen button of the Facebook player! Please be advised that this video service is on a one minute delay! For more videos checkout our Video Gallery. Praying for our students, teachers, facualty and staff members for any and all campuses, may they have a blessed school year 2018-2019! 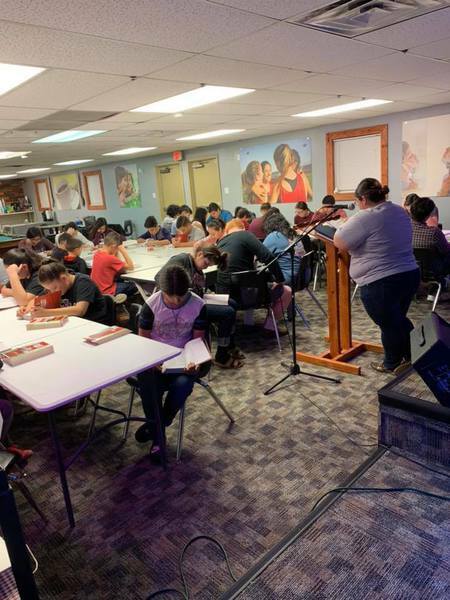 It has been seventeen years now that the Lord had been dealing (using this word mindful of what the Holy Spirit has presented) with me about the city of Cotulla, TX. The Lord had been developing / training us in the gift of the ministry under the Leadership of Pastors Tommy and Rachel Burchfield in Columbus, TX. Our life's goal has been and will always be to honor Jesus as I serve His people. For 15 years the Lord kept Kim and I under this Word of Faith, Holy Spirit Anointing in which we have seen multiple tens of thousands say yes to Jesus and surrender to His love which never fails. In my recent visits to Cotulla, a love for His people has grown deeper in me like never before. My connection with my family that serves throughout the community of Cotulla had become clearer this year (2012) for my next step in my life. This call to life and victory in His Word has become as a burning fire! "His Word" as the Prophet Jeremiah so boldly declared "I can't hold it back" is burning in me. This I know by the leading of the Holy Spirit that Kim and I along with my family have been commissioned / assigned to South Texas for the cause of Jesus Christ. The year 2012 the Lord had brought many confirmations of this next and new exciting season of my life. With joy and confidence this I know “He calleth me". I have answered the call to serve Jesus Christ as one of His Shepherds. I look forward in the present/future of Cotulla and surroundings areas for Jesus. Kim and I personally invite you to visit with us and our Church Family. As you arrive you will be greeted with love and appreciation because we believe in Gods love for humanity. A place to learn the Word of God. A place to Worship. A place where families can grow spiritually. We believe Living Faith Family Worship Church is a church where Jesus is Lord and families can be cared for and trained. 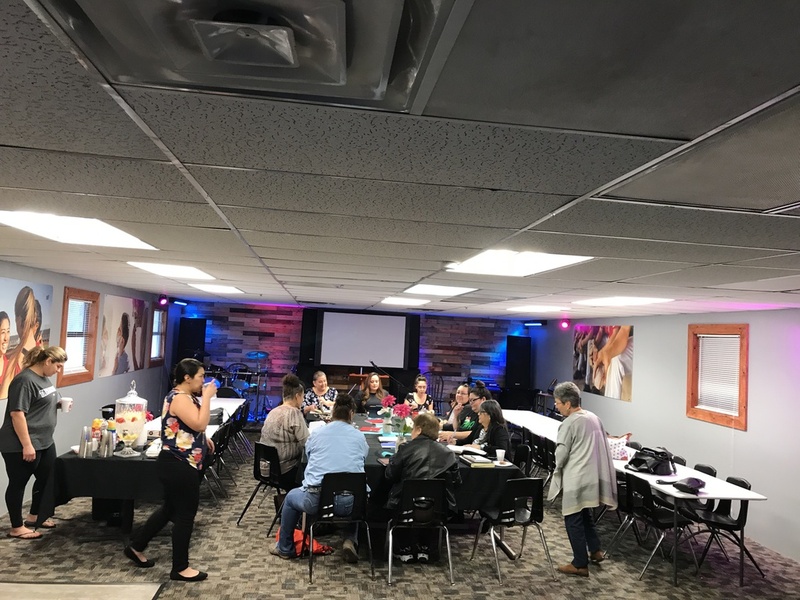 A church where personal ministry is provided A church where families and individuals can receive strength in time of need. A church where the Word, Worship, Witness and the World is our focus. Our prayer is that you will join us to personally experience the true love of the father, Jesus Christ His son and the freedom of the Holy Spirit. Each service is alive and life-changing. We are confident you will be blessed and leave encouraged!